This post was written by Richard Schiffman and originally appeared on EcoWatch. Reprinted with permission by the author. 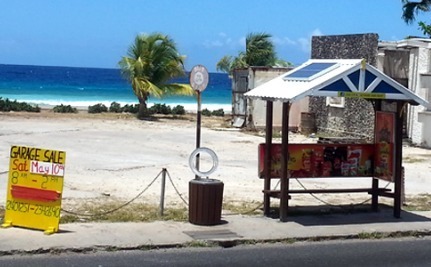 For Barbadians, the cost savings from solar are becoming too obvious to miss. A thermal water heater, which retails for $2,300 USD, pays for itself in lower electricity bills in less than two years. That goal won’t be hard to reach. Not only is the island blessed by abundant sunshine, but it has year-round trade winds to run wind turbines. The Barbados government is also looking into harnessing the energy of the tides, as well as introducing ocean thermal energy conversion (OTEC), a technology which employs the temperature difference between cooler deep and warmer shallow sea waters to generate electricity. The Barbados government commissioned a Green Economy Scoping Study, prepared in partnership with UNEP and released last month in Bridgetown, which includes recommendations on how to make the island’s agriculture, fisheries, transportation and energy systems more sustainable. But even aside from these escalating environmental costs, the federal government is subsidizing the fossil fuel industry to the tune of a half a trillion dollars a year in tax breaks, according to the International Monetary Fund, making the U.S. the largest benefactor of fossil fuel industry in the world. Renewable energy also gets government support to be sure; however, worldwide, fossil fuel subsidies were at least six times larger. This makes no sense. We should be supporting the technologies that help us to put the brake on destructive climate change, rather than fanning the flames of the unsustainable fossil-fuel habit that is driving it.